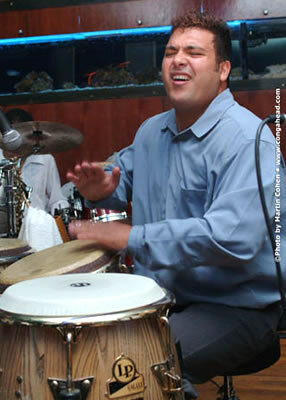 Venezuelan-born percussionists Roberto Quintero and Luisito Quintero, who are cousins, have been playing music together since childhood. They demonstrated their considerable musical skill recently when they gave a performance at the Wednesday Night Latin Jazz Series held at the Arka Lounge in New York City. Musicians playing on this night were percussionist Roberto Quintero who played LP Galaxy Giovanni Series Premium Wood Congas, Luisito Quintero who played LP’s New Bronze Shell Tito Puente Tribute Timbales and drums, Ruben Rodriguez on bass, Luis Perdomo on piano and auxiliary percussion and Max King on saxophone. Click here to view photos of the event found exclusively at congahead.com.